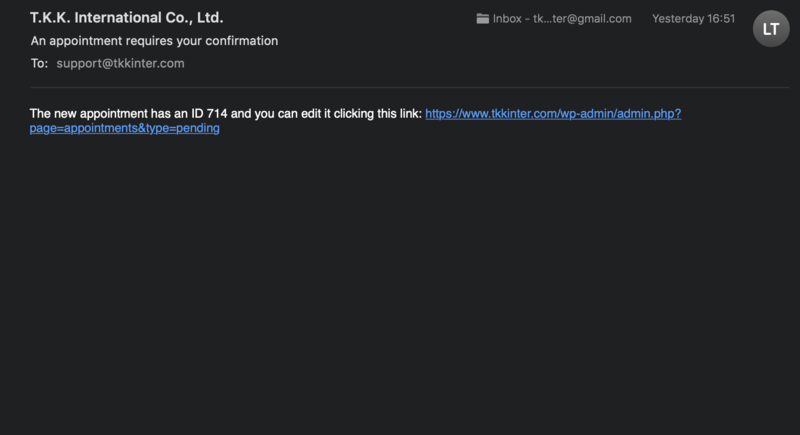 Is there any way that I can add html to the pending confirmation email that's send to admin? HTML in email add-on is basically only for the emails that are sent to clients that are booking appointments. Notifications for admin are not covered by that add-on. However, I can see there is a filter in the plugin code that might help with changing that email so it will contain HTML as well. I will need to further consult this with the developer to get an example code snippet that would work for you. I will post the solution as soon I will get it. I've created a mu-plugin for you so you can change the e-mail message ( body ) to add any html that you like and modify it. You can see a small preview and the code at the end of this reply as well. You will have to alter the $body on the "change_email_body" function to anything you like. I've made a simple start just to have it as a preview. * Description: mu-plugin for changing the Appointments pending body message. * @param string $body The body of the e-mail. * @param array  $r Request. * @param int    $app_id The Application ID. * @return string $new_body The new body of the e-mail. * Changes the e-mail headers to text/html. * @return string Header content type of text/html. Hi Konstantinos thx for the help, but it's not work after I upload it in my mu-plugin folder the email i got is still the same without html. This is the html email I try to put in the php code please take a look. Here is the HTML file please guide me how can i put this code inside of the php code. Could you please download and replace the previous file with the one from https://gist.github.com/wpmudev-sls/ab08d64559ca6bfdd533bcf84a61e5ec . You will see a download button on the top right corner. as well to change the Admin e-mails, previously it was implementing HTML on the 'service providers' emails only. Sorry I misunderstood the OP. As for the html you provided above, since the forum has changed some of the styling etc, could you please paste your code somewhere online i.e. Pastebin or upload that html somewhere on your website and give me a link so I can copy it from there and have it 100% clean to help you out if you want? This new .zip includes the final file with your html implemented as well. Give it a test and tell me if everything is alright or if you need any extra changes !